John C. Maxwell is an accomplished author, speaker, pastor and leadership expert. He has written well over 70 books and has sold over 24 million copies. Many of those books, including The 15 Invaluable Laws of Growth, have reached the New York Times Bestseller list. On top of being an accomplished author, John is also a sought after speaker. He has spoken to millions of people around the globe about leadership and how it applies to everyday life. John Maxwell is a wise man. I had the opportunity to hear John Maxwell speak, the latest being December 2018 at The Titan Summit in Toronto. While his words are simple, his passion and experience behind them are moving. You can tell that at the age of 71, John Maxwell is living his best life. As a writer, I was in awe of how he forms his words when he talks. His delivery on stage flows like a lazy river, but your mind races like a waterfall when John makes his point. 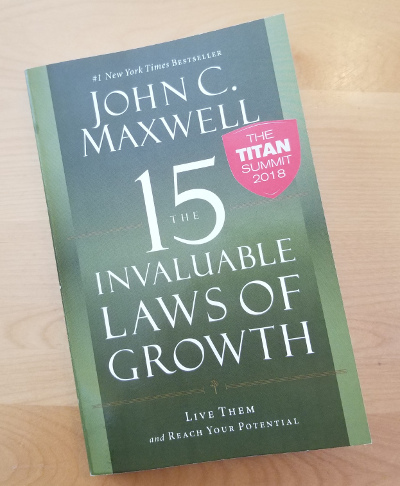 After reading The 15 Invaluable Laws of Growth, I learned that John Maxwell writes in his book in the same way as he speaks. The 15 Invaluable Laws of Growth follows a very distinctive and easy to read. In each section of the book, he talks about the 15 laws of growth that he deems as being an integral part of personal growth. At the beginning of each section, he explains the law and how it pertains to the reader. He then uses many excerpts from other authors and world leaders’ books to back up his case. For every law, he uses his own well-lived stories that lend credence to the fact that he practices what he preaches. To close out each section about the law of growth, he reviews all the points made during the chapter. In each review, John gives numbered lists of wisdom aimed at helping the reader apply the law that they just read. After each section or law, you’re left with not only the shared wisdom but actions you can implement into your life. I have not read John’s other books, but this seems to be a tried and true method that he uses to inspire action in the reader. In The 15 Invaluable Laws of Growth, John shares hundreds of quotes that make you think. Not only does he share his wise quotes, but he shares quotes from other accomplished leaders of our world. Each quote is highlighted in blocks so the reader can easily find them. I enjoyed reading each quote and reflecting how it could apply to my life. I’m not where I’m supposed to be. I’m not what I want to be. But I’m not what I used to be. I’ve just learned how to keep going. That little block of text John wrote moved me to reflect on my life. I dog-eared that page so that every time I pick up this book, I will reread that page — what a fantastic piece of wisdom shared by a very wise, humble and charismatic man. While The 15 Invaluable Laws of Growth is a very thought-provoking book, it does have its head-scratching moments. John Maxwell is a senior pastor whom spent a few decades of his life leading many Christian churches to incredible growth. While John is not over evangelical in this book, he certainly doesn’t hide his religious views. These references may be a put-off to some readers who may not expect it. I believe that most people who make these kinds of devastating trades don’t realize they’re making them until after it’s too late. That’s why I believe it’s important to create systems and draw lines to keep ourselves safe. For example, I give Margaret veto power over my schedule to keep me from spending too much time working. I also avoid being alone with any women other than family members. I struggled with how to digest that paragraph in the book. Up until this point of my reading, I’ve had no issue with his references to God and religion. But this value he shared, I felt it showed a bit of weakness on his part. I didn’t appreciate his remark. But considering the wealth of wisdom that I did get from the book, I was willing to move on from it. However, I will be honest; he lost a little bit of credibility with me. Overall, The 15 Invaluable Laws of Growth was an effortless, flowing read. I found many nuggets of wisdom that I will take away and execute. While I did thoroughly enjoy the book and gained some great insight, I cannot give it top marks on account of his remark about being alone with women. I give The 15 Invaluable Laws of Growth by John C. Maxwell 3 stars out of 5.